Looks Good from the Back: Side-Eye Emoji Deployed. A: DOES IT COME WITH A BAR OF GOLD. M: Sold out in size medium and large! So! A: They only have one of each size and Jenna Lyons bought two as a last-ditch effort? A: Kanye does the best gifs. Wow. Just wow. No wonder they are in the news a lot lately (lots of "what's going wrong with jcrew?" articles). If they removed the two Holly Hobbie pockets on the front (proportional cost: $200 each), that would be money well not spent. 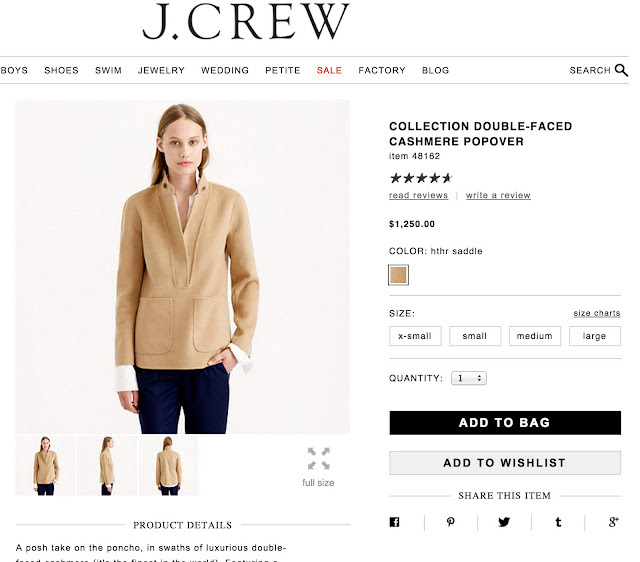 As to J.Crew's sales woes, I guess they figured if they can't sell a dozen $50 to $100 sweaters to normal people, they might pin their hopes on one rich fool impressed by this exclusivity. I was so excited when a J.Crew opened in my city, but the fabrics are oddly stiff and the cuts very square. Who are these wide-shouldered women with petite waists? (Swim teams?) Very odd. Also absurdly limited stock & terrible return policy outside the US. Thanks for the mockery, A & M! $1,200 for that boring, weirdly-pocketed, probably itchy POS? It looks like a smock Heidi (of the epoonymous children's book) would wear watercoloring mountainscapes on a chilly day, while Peter watches the goats and grandfather prepares her a wholesome supper dish of Rösti in his quaint cabin. No? Too abstruse? Can't picture it? EXACTLY. This isn't mall store fashion; it's performance art. And Jesus, J. Crew. Would it kill you to brush the model's hair?